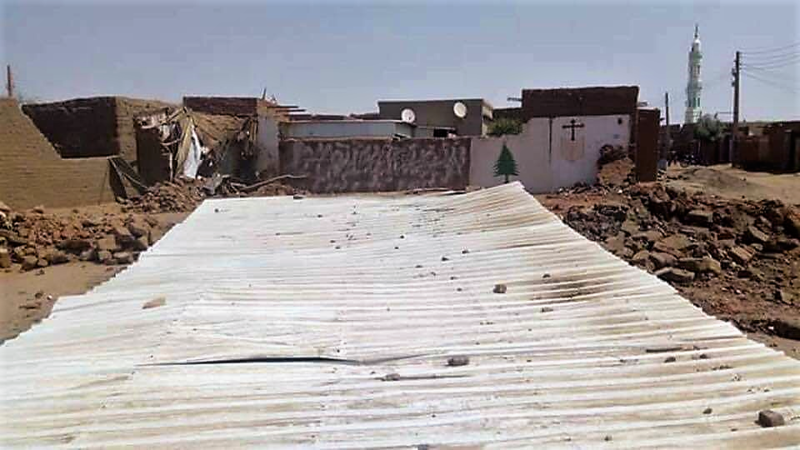 A church belonging to the Sudan Presbyterian Evangelical Church (SPEC) denomination in the Khartoum suburb of Haj Yousif was demolished yesterday (11 February). The police arrived with three lorries shortly after the Sunday morning service and confiscated furniture, Bibles and musical instruments, before knocking down the 29-year-old building. The demolition went ahead despite a pending legal appeal. “We had hoped [officials] would not attack our church outside of the court ruling, but it is clear the government is acting outside of the courts,” a SPEC leader, who wished to remain anonymous, told World Watch Monitor. Government officials claimed the congregation did not have the required permission to meet in the area, though SPEC leaders said they have the correct legal documents for the church, which was built in 1989. The congregation was aware of objections to the presence of a church. Five years ago the Public Peace and Safety Committee, which consisted of local people, decided it wanted the church to be knocked down. In 2017 the building was placed on a list of 27 churches that the government was planning to demolish because they were said to be in violation of the designated purposes of the land they were built on. The church’s problems with the government date back to 2012, when the Evangelical Community Council, a SPEC committee responsible for managing the denomination’s properties, appointed Rafat Samir as chair to replace Hamad Muhammad Salah. Salah was dismissed over fraud but won his appeal and was reinstated by the government, even though it had no legal authority to do so. A number of SPEC members who objected to Salah’s reinstatement ended up in court. Earlier this month seven of the church’s leaders were fined for their “objection to the authorities” . Nineteen other members were freed due to lack of evidence. Meanwhile, five leaders from the Sudan Church of Christ (SCOC) are scheduled to appear in court on 6 March to face unknown charges in another ongoing case against a church in Khartoum. The five men were detained in October 2017 and ordered to hand over ownership of their church from the church-elected committee to a state-sanctioned rival committee. They refused and were released without further instruction. But a few days later they were charged with causing sound pollution because their church services were “too noisy”. Two SCOC buildings, which were also on the list of 27 churches scheduled for demolition by the government, were torn down in May 2017. In November 2017 the US Deputy Secretary of State called on Sudan to “immediately suspend” its demolition of churches. John J. Sullivan, speaking at the Al-Neelain Mosque in Omdurman, told a group of interfaith leaders that “the treatment of members of religious minorities is often the ultimate indicator of a government’s commitment” to religious freedom. But last month, Abu Bakr Ibrahim, Sudan’s Minister of Guidance, countered allegations of an absence of religious freedom in the country. He said his ministry was “fighting the phenomena of extremism and radicalism by adopting the principle of moderation”. He added that the embassies of Norway and the Netherlands had requested translations of the materials used in a recent workshop by the Ministry for Religious Co-existence, which was said to have been attended by a number of Christians.